There are only a few brands who really support me because of who I am, they don’t look at the amount followers or how high my engagement is. 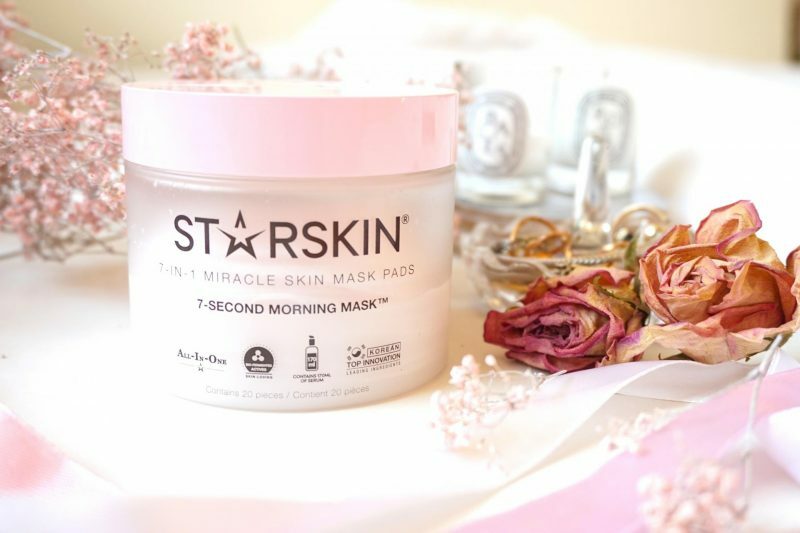 Starskin is one of them and I am really excited to talk about their 7-Second Morning Mask. When I just started my Instagram they noticed me instantly and supported me during the difficult times when my mom passed away. I wish every brand sees their customers/influencers like Starskin! 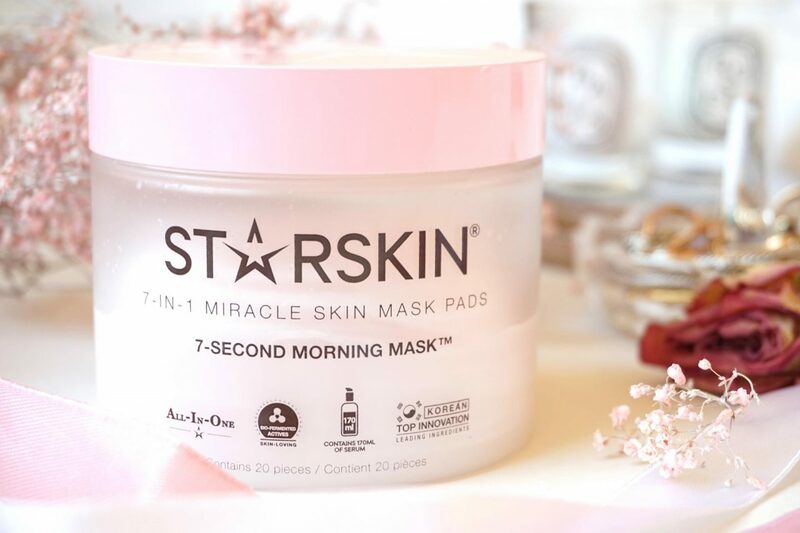 Enough emotional talk, this 7-in-1 miracle skin mask pads are a whole new invention. 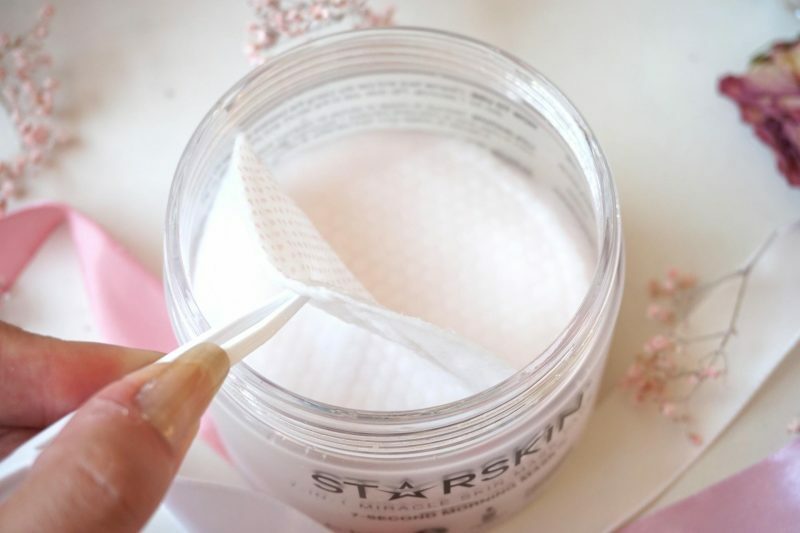 I’ve seen several Korean brands with the same concept but the pads from Starskin stepped up their game in their functions of this product. You have to try this out. Start reading to know why! 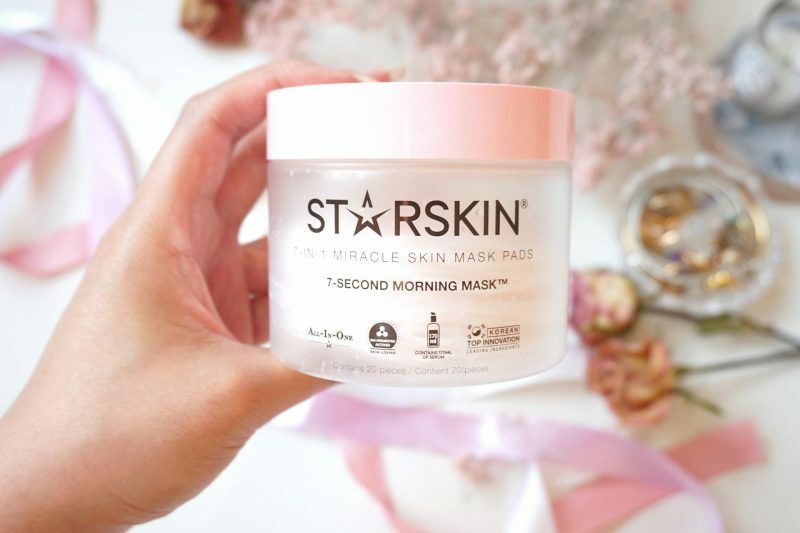 7-Second Morning Mask™ is a new-generation all-in-one beauty innovation that combines the ultimate 7-step morning skincare routine into one easy-to-use Mask Pad that delivers instant results – within seconds! Perfect as an instant skin brightening treatment – before a date or special occasion, an important meeting, a fun evening out with friends or whenever your skin needs an extra boost – for that gorgeous glow! Let’s start with the packaging. Starskin puts a lot of attention into their products. If you have seen their bio-cellulose sheet masks before you may noticed that every type has its own beautiful color and name. 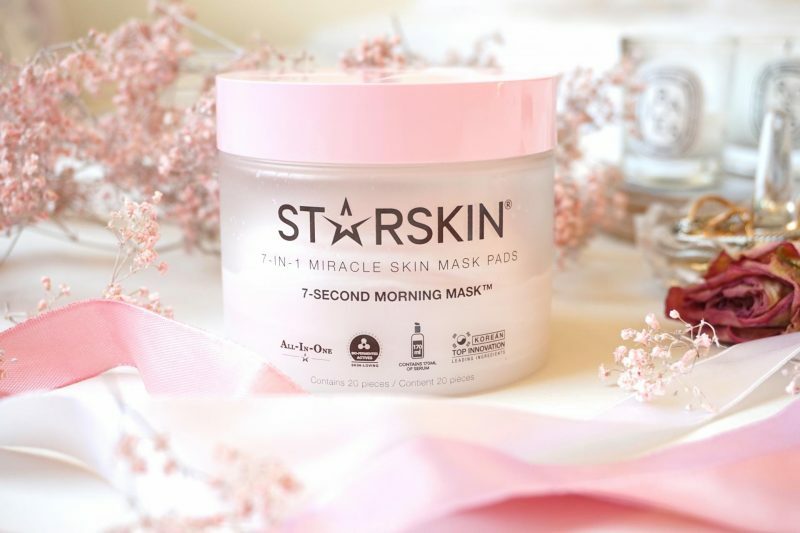 The 7-Second Morning Mask has a beautiful baby pink lid with a star on top, because duhhh Starskin. The jar has a soft finish and isn’t totally see through. I kinda dig the look of this jar, it has a cute color and the this is something I can put on my vanity instead of hiding it in one of my drawers. On the side you will find all the functions of the pads. What made me really happy was that this pad is a makeup primer! I’m a bit skeptical because I have super oily skin and I’m super terrified that I will end up with a shiny thick mess on my face. Another thing is: how is this pad going to exfoliate your skin with the beads? I don’t know, it sounds too good to be true. That’s why I also wanted to try it out so badly. My lovely Birtany and old Social Media Manager of Starskin told me she loves this product and that I had to try it out to see/feel it myself. Well, can’t wait to tell you how this ends. The moment you open the lid you will find this pincet on top of an extra lid keep the pads fresh and moist (when I say ‘moist’ in real life, people always say ‘it sounds so dirty when you say that!’). 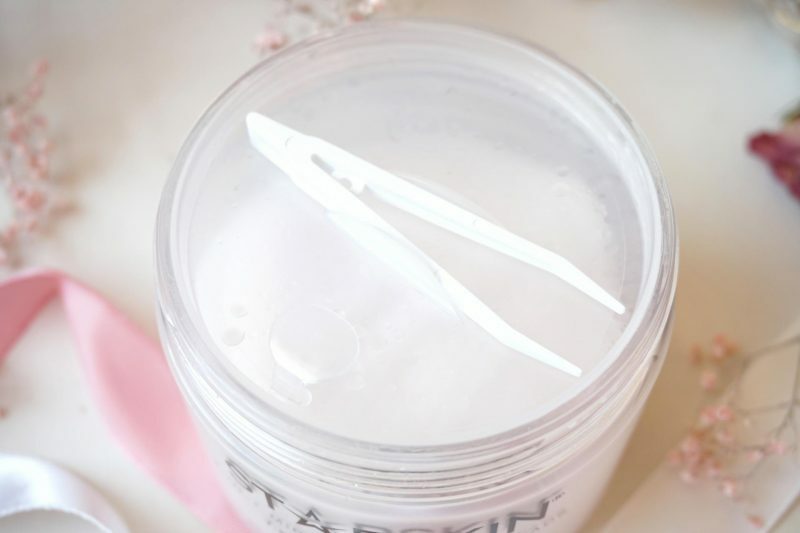 The pincet is a handy tool to grab the pads easily out of the jar without using your dirty fingers. I give you the advice to use a pincet with every product that has something similar like this. 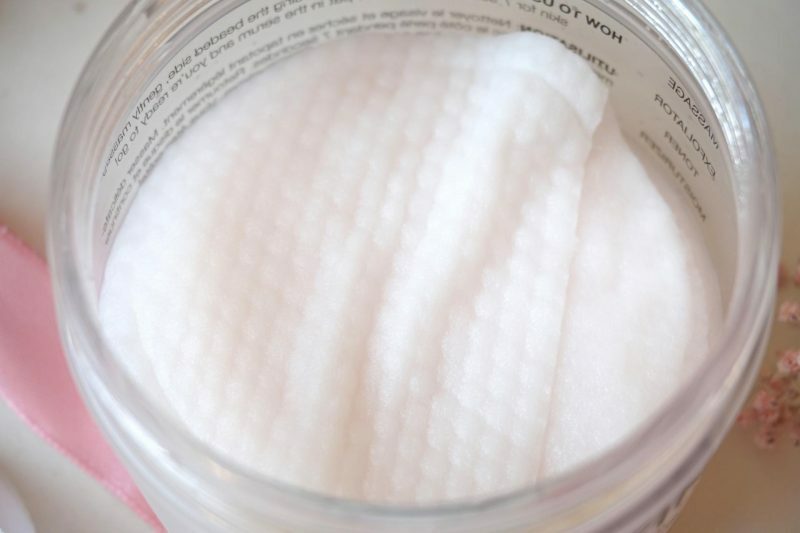 How would you feel when you first grab a pad with your dirty fingers and you leave a trace of bacteria in the jar, with pads you will use the next time on your face? The same thing with a jar of moisturizer, please try to get use to using a pincet or a spoon when you grab/scoop products out of a jar! Hmmm, it has a soft fresh scent! No chemical trace in my nose, just a pleasant scent that makes me excited to use the pad. The soft side of the pad is on top of the whole pile of pads. When I see this I start to reconsider what I just told you about using the pincet. They put this side on top so you can easily stick your fingers under the sachet and then you can lift it up without touching the other pads! Genius I think. Oehhh, see here the rubber beads showing up when I lift it up with the pincet. 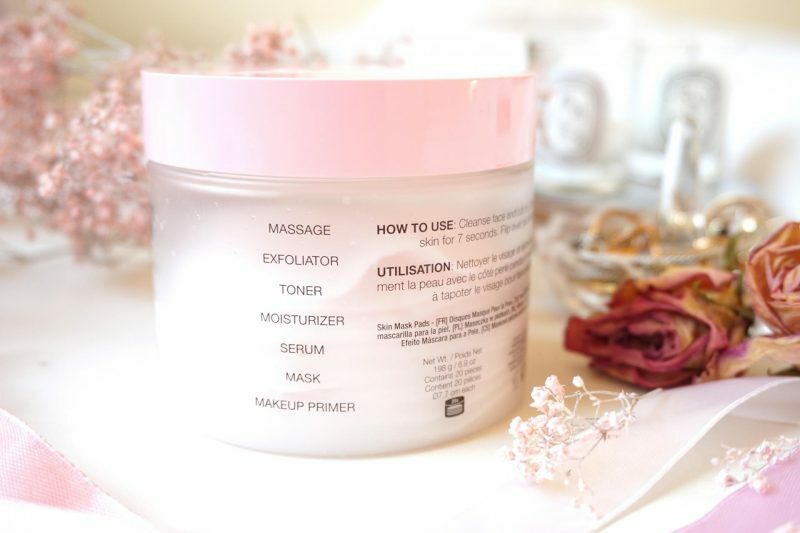 I’m still a bit concerned when I see the beads because how are they exfoliating the skin when the products that’s infused into the pads is a more moist/primer/ toner consistency? They look very soft to me and also because I have very oily skin. Hmm ohh well, still have to try it out! So, the first time I tried the 7-Second Morning Mask I noticed how wet these pads are. They are soaked with amazing ingredients that will give you 7 wonderful results on the skin within only 7 second of each side of the pad. I had no problems with using the pincet to grab the pad. The sachet which is made to put your fingers in it for application and grip is big enough for 2/3 fingers. I can see the beads from a closer look now and I start to think that this won’t work for me at all as an exfoliater. They look so round and soft, how are they useful for exfoliating the skin? I believe it will massage the skin by giving it a gentle feeling but yeah, wait for it! First I used the beaded side. For 7 seconds I felt … something. Maybe it is my super oily skin or maybe it was because the first pad on top is maybe more soaked than the others? But I thought it didn’t give my skin any special feeling. Yes, I did feel the beads on my skin but it was not like a gentle massage but more like little almost gentle massage. In my opinion they could make the beads a bit bigger or make a different pattern on the pad like a chainsaw? Then we head over the soft side! A wonderful experience on my skin, like a fluffy white cloud on my face. 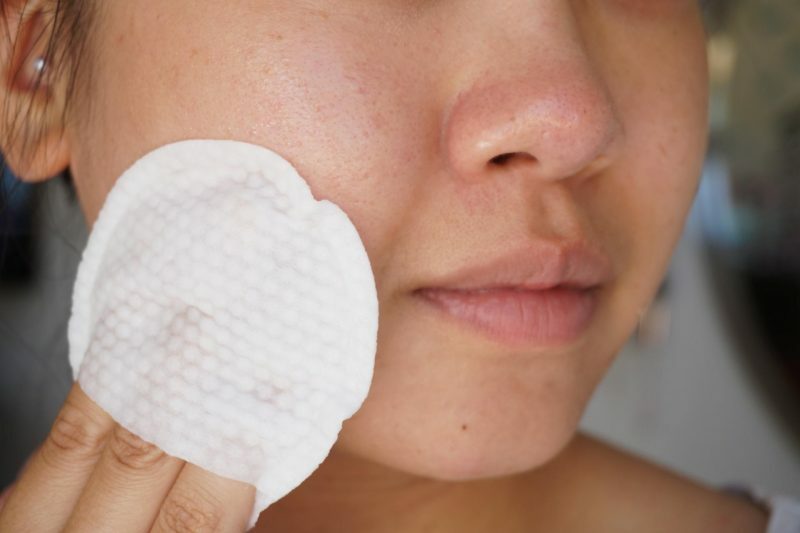 I really enjoy this side of the pad and I can really feel now that my skin starts to relax and gets a glowy look (or my skin starts to get oily). 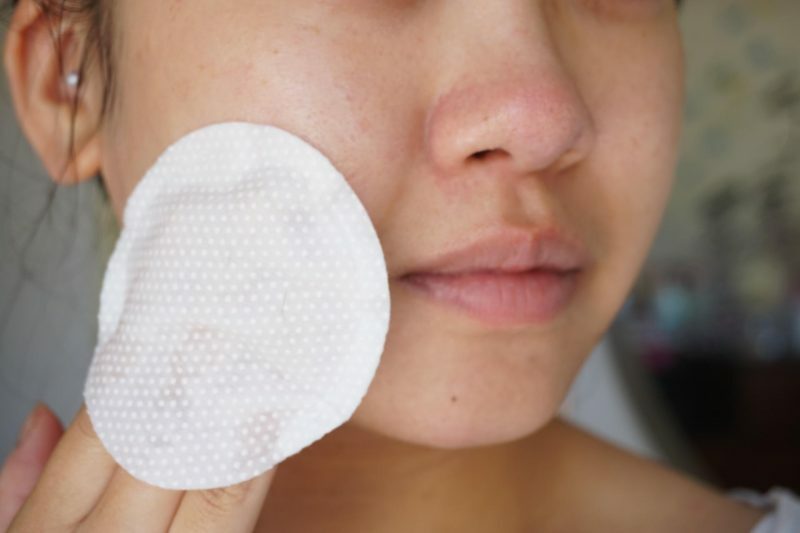 I gently swipe the soft side of the pad alongside my face and as last I start tapping the pad on my skin so the product will get better absorbed into the skin. After I finished using the two sides, I can see a super shiny face in the mirror. I feel my skin and I really start to think: Do I have to wash this off? How can my skin absorbs this much product? My skin is already super oily so I’m afraid that it will clog my pores. I start to grab a tissue and gently tap the excess product of my face but still leave a subtile layer on my face. BUT I also left the product on my face one time but I really had to wait until my face was fully dried for starting my makeup routine. Not a real problem but my idea behind this 7 second mask is to start quickly in the morning. Now my skin looks less soaked I start to tap the left over product into the skin with my fingers. When it start to dry up I skip my normal skincare routine and makeup primer and immediately apply my makeup. 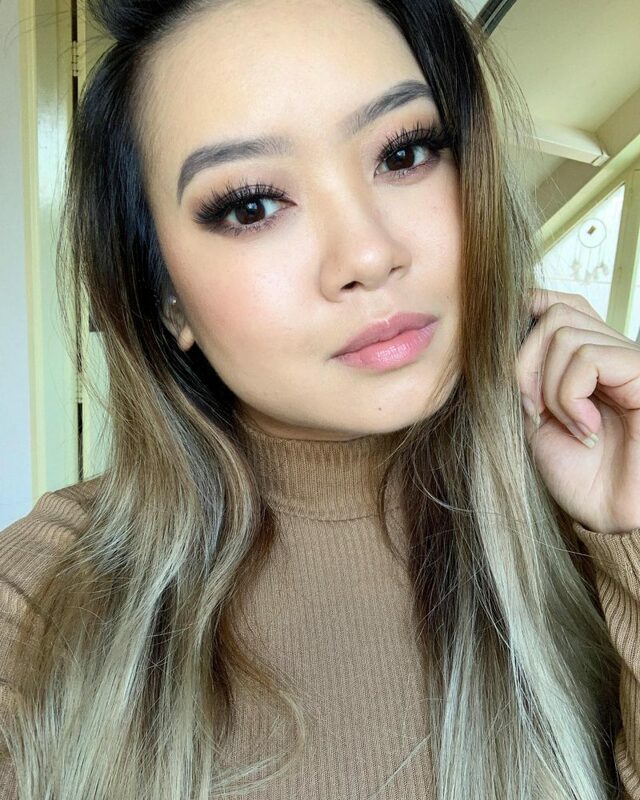 Whooo, my skin looks amazing when I finish my makeup! Glowy and flawless, like I drink tons of water. What really surprises me is that my makeup stays for a long period of time on my face. It really works as a makeup primer. Ofcours my skin starts to get super oily, which also means that my makeup start to glide of but it doesn’t makes my skin more oily than it usually is. As an oily skin girl I have to say that this product can be too rich for my skin. I prefer removing the excess product of my skin so it will absorb faster. When I don’t do this I can feel my skin the whole day on a negative way, it feels sticky and heavy. But when the products has been soaked up all the way into the skin, the playtime starts! When doing my makeup routine I noticed how great my skin looks, this with skipping my regular skincare routine. My makeup looks flawless and it doesn’t make my makeup less long-lasting than it usually is. When I wash my face before going to bed, I noticed how smooth my skin is after wearing the serum of the pad on my face all day long. Like I had an overnight facial mask, super smooth and hydrated! The beaded side is the only thing I don’t really enjoy because I expected a more massage feeling with texture. Instead of texture the beads glided on my skin without giving any effect on the massage feeling. Also at some point gel layers start to appear on my skin. No sure if I used the beaded side to long that they start to rip open or that it is the exfoliate function. 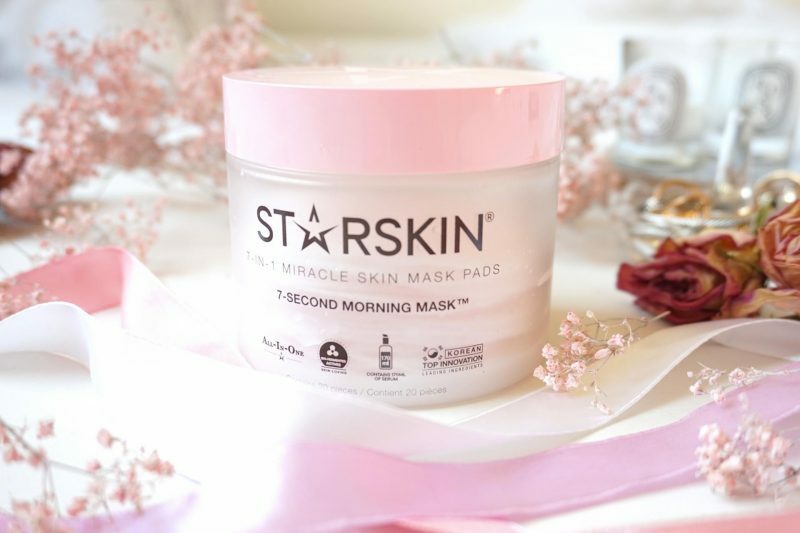 You can get your own 7-Second Morning Mask for €30,55 at Douglas.nl or €32,40 at FeelUnique.com. Sounds like a great multitasking mask!!! Aww I always love hearing about brands with great customer (or in this case influencer?) service – it makes me want to support the brand so much more! Anyways I really like the idea of this product, sounds super convenient for lazy mornings. I was skeptical of its effectiveness at first but I’m glad to hear it works well, especially for combo skin types! Thank you for the thorough review! I had no idea that Starskin had these types of products! Your review was very thorough and I like that you expressed your honest opinions about it, even if the product was PR! I feel like more bloggers need to be like that. I like that it has a little pocket to put your fingers! Also, the word ‘moist’ just sounds so wrong in English I dunno LOL. Like, I never even try to say or use it to describe products because I get some shiver or something, it’s one of those weird words haha. Great post as always babe!